Amanda Server is routinely backed up as its own client. End to end test page allows user to conduct a quick test that an Amanda server can be backed up as its own client. The test creates a "test" backup set. The test backup set contains a file on the local machine ( Amanda server) that is backed up to a local disk. The test does a complete backup, restoration and compare of the restored file contents. Like all other functional pages of ZMC, the End to end Test page has its main functionality in the center, while other common-to-most-pages functionalities are grouped at the top of the page. The main functionality of the End to end Test page is to allow users to check out that the Amanda server can be backed up as a client. when the distribution/OS is upgraded. Users need not run an End to end test whenever they make a new Backup Set configuration. Click the "Perform Test" Button (labeled No 1 above). The text in upper right hand rectangle (No 2 above) will change to indicate that the Configuration Verification process has started. Further progress messages/ error messages will appear in Rectangle 3 above. 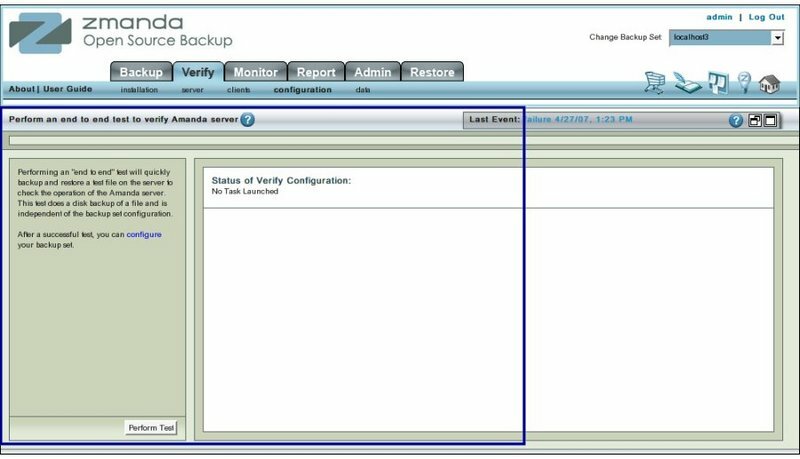 Success implies that it is technically feasible to backup data on Amanda Server while treating it as an Amanda Client. Nothing is implied that this is an optimal overall way to organize user's  backup needs. Clicking it will restore the page to a initial clean status from where the End to end test can be re-run. Otherwise users should go to Verify Server page that is on the next tab.